Every major Italian city airport offers reliable airport shuttles, transfers and authorized taxis from the airport to the city center. Most cities — including Rome, Milan, Turin and Palermo — also have a reliable airport express train direct to their central train station. Whether you’re arriving or departing, some quick planning will help you decide how you want to travel from the airport to begin your Italian journey. Rome’s main airport, Leonardo da Vinci International Airport, is located at Fiumicino, 22 miles (35 km) from Rome city center. Rome airport express train:The Leonardo Express is a non-stop train service running between Roma Termini train station and Rome Leonardo da Vinci–Fiumicino Airport. It leaves the airport every 15 minutes during peak times, and every 30 minutes during off-peak. Rome airport shuttle bus: SIT operates a shuttle bus between Leonardo da Vinci–Fiumicino Airport and key stops in Rome — including the Vatican and Rome’s Termini train station. You can buy tickets online or on board the bus. Taxis: Taxis to Rome's city centre take approx 45-50 minutes, but it can take a longer during rush hour. Make sure you take only authorized taxis — the white taxis with a taxi meter available at the arrival terminal. Authorized taxis charge a fixed fare to Rome city center; make sure you tell the driver you are aware of this fare. Rome’s G.B. Pastine Airport is in Ciampino, approximately 9.3 miles (15 km) from Rome city center. Rome Ciampino shuttle bus: SIT operates a shuttle bus between Ciampino G. B. Pastine Airport and key stops in Rome — including the Vatican and Rome’s Termini train station. You can buy tickets online or on board the bus. By bus and subway: Buses, operated by Cotral, depart from Terminal 2 and stop at Anagnina subway station. From there you can take the train into the city center. By bus and train: You can take the bus to Ciampino railway station, then travel by train to Rome city center. By taxi: Taxis are located opposite the International Arrivals hall. Make sure you take only authorized taxis — the white taxis with a taxi meter available at the arrival terminal. Authorized taxis charge a fixed fare to Rome city center; make sure you tell the driver you are aware of this fare. Milan’s Malpensa Airport is located 31 miles (50 km) from the city center. Milan airport express train: There are express train stations located in Terminals 1 and 2 at Milan Malpensa Airport, where you can catch express trains directly to Milan Central or Milan Cadorna train station (make sure you choose the right train). Operated by TRENORD, tickets for the Milan airport express are available online, or at the airport. Milan Malpensa airport shuttle: Shuttle buses managed by various companies run from Milan Malpensa to Milan city center, Milan Central train station and Turin, Genoa, Como, Lugano and Linate Airport. Visit the Milan Malpensa airport website for details. By taxi: Taxis are located in front of the arrival terminal. Make sure you take only authorized taxis — Radio Taxi or Taxi Blu, for example. Taxis to Milan city center take approximately 45 minutes. Milan Linate Airport is located approximately 6.2 miles (10 km) from the city center. By train: There is no train station at Milan Linate Airport. Milan Linate airport shuttle: The Air Bus, ATM Servizi Diversificati, brings passengers from Milan Linate Airport to Milan Central train station. The bus leaves every 30 minutes and takes 25 minutes. By taxi: Taxis are located in front of the arrival terminal. Make sure you take only authorized taxis — Radio Taxi or Taxi Blu, for example. Taxis to Milan city center take approximately 10 minutes. Palermo’s Falcone Borsellino Airport is located approximately 21.7 miles (35 km) from Palermo city center. By train: The Trinacria Express train runs from Punta Raisi train station (located below the airport) to Milan Central train station. The trip to Milan Central Station takes 60 minutes. You can buy tickets from kiosks on the train platform. By bus:An airport bus between Palermo Punta Raisi Airport, Palermo Central train station and Politeama leaves the airport every 30 minutes. The trip takes approximately 55 minutes to Central Station and 40 minutes to Politeama. Bus service to Agrigento, Trapani and Sciacca is also available. By taxi:Taxis are available at the arrival terminal. Make sure you take only authorized taxis.The trip takes 45 minutes and costs approximately €35.00. Venice Marco Polo Airport is located 7.4 miles (12 km) north of Venezia. By train: The ATVO Fly Bus will take you from Venice Marco Polo Airport to Mestre train station, located near the airport. From here you can take a 12-minute train trip to Venice’s central Santa Lucia station. By bus: You can catch the ATVO airport express bus from Venice Marco Polo Airport to Piazzale Roma in Venice city center. The trip takes 20 minutes. By water Bus: ALILAGUNA operates a water bus from the dock at Venice Marco Polo Airport to St. Mark Square in central Venice, stopping briefly at Murano and Lido, the local beach resort, before reaching Venice. The last water bus leaves Marco Polo Airport just before midnight. Private transport: Private water taxis are available to bring you from Venice Marco Polo Airport to your hotel. One water taxi can accommodate six people with their luggage. Be careful: this option can be expensive. Be wary of water taxi drivers looking for passengers inside the airport — they can be very expensive. By taxi: Taxis are available at the Venice Marco Polo Airport arrival terminal. Make sure you take only authorized taxis. Florence Amerigo Vespucci Airport is approximately 3.1 miles (5 km) from Florence. It takes 25 minutes to get to the city center. By train: There is no train station at Florence Amerigo Vespucci Airport. However, you can take a shuttle bus from the airport to Florence Santa Maria Novella central train station. The bus trip takes about 25 minutes. By bus: The Florence Peretola Airport express, run by ATAF Volainbus, leaves the airport every 30 minutes. Depending on traffic, it takes 25 minutes to arrive at Florence’s central Santa Maria Novella train station. By taxi:Taxis are available at the arrival terminal. Make sure you take only authorized taxis.The trip takes about 15 minutes. Naples Capodichino Airport is located about 3.7 miles (6 km) from the city center. It takes approximately 1 hour to drive from Naples airport to Pompeii. By train: There is no train station at Naples Capodichino International Airport. The Naples Alibus Airport Shuttle will bring you from Naples Capodichino Airport to the city’s central train station. 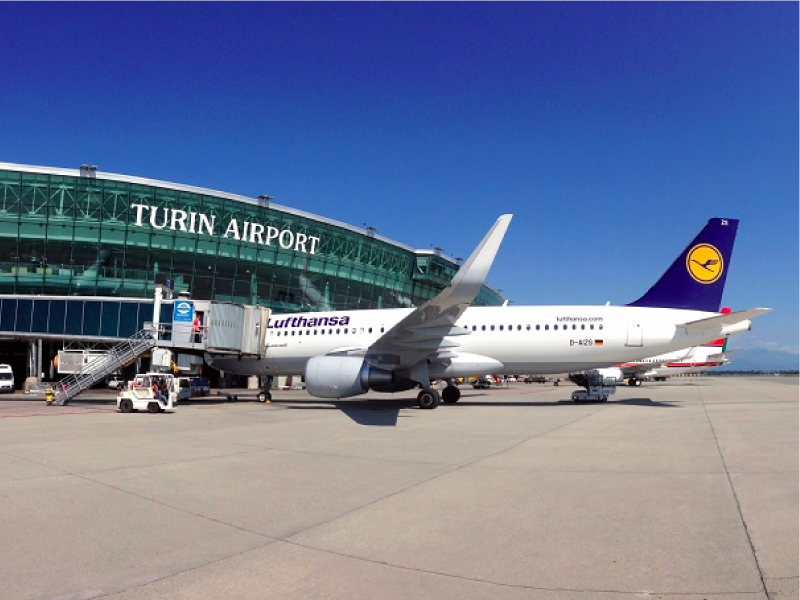 Turin-Caselle Airport is located 10 miles (16 km) from the city center. By train: The train from Turin Caselle Airport to Turn’s central Dora Railway Station takes 19 minutes. You’ll find the train station just outside Turin’s airport terminal. By bus: An airport express bus runs every 30 minutes between Turin Caselle Airport and Turin’s central Dora Railway Station. It also stops at Porta Nuova and Porta Susa, corso Umbria, via Borgaro, Borgaro Torinese and Caselle city centre. The trip takes approximately 45 minutes. By taxi: Taxis are available at the arrival terminal. Make sure you take only authorized taxis. The trip takes about 30 minutes.